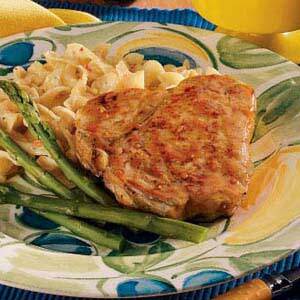 These moist chops come together quickly and the glaze is delicious. Since this entree requires a single pan, cleanup's quick, too. In a nonstick skillet over medium heat, brown pork chops on both sides. In a bowl, combine 1/3 cup vinegar, soy sauce and garlic; pour over the chops. Cover and simmer for 8-10 minutes or until the meat is no longer pink. In a bowl, combine the cornstarch and remaining vinegar until smooth; stir into the skillet. Bring to a boil; cook and stir for 1 minute or until thickened. Yield: 4 servings. How To Keep Your Fridge the Cleanest You've Ever Seen! BEANS and TOFU-Done Right, They're DELICIOUS! FRUIT COCKTAIL: Surprises in a Can! Take Your Dishes From Blah to Wow! Can I Eat Fruit If I Have Diabetes? 4 Compelling Reasons You Should!